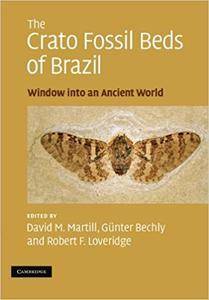 David M. Martill, Günter Bechly, Robert F. Loveridge, "The Crato Fossil Beds of Brazil: Window into an Ancient World"
This beautifully illustrated 2007 volume describes the entire flora and fauna of the famous Lower Cretaceous Crato Formation of Brazil - one of the world's most important fossil deposits, exhibiting exceptional preservation. A wide range of invertebrates and vertebrates are covered, including extended sections on pterosaurs and insects. Two chapters are devoted to plants. Many of the chapters include descriptions of new species and re-descriptions and appraisals of taxa published in obscure places, rendering them available to a wider audience. Fossil descriptions are supported by detailed explanations of the geological history of the deposit and its tectonic setting. Drawing on expertise from around the world and specimens from the most important museum collections, this book forms an essential reference for researchers and enthusiasts with an interest in Mesozoic fossils.